Andrew Shaw has apologized for saying something that apparently no one heard. "I want to apologize to the gay and lesbian community," Shaw said Wednesday. "I'll never use that word again, that's for sure." 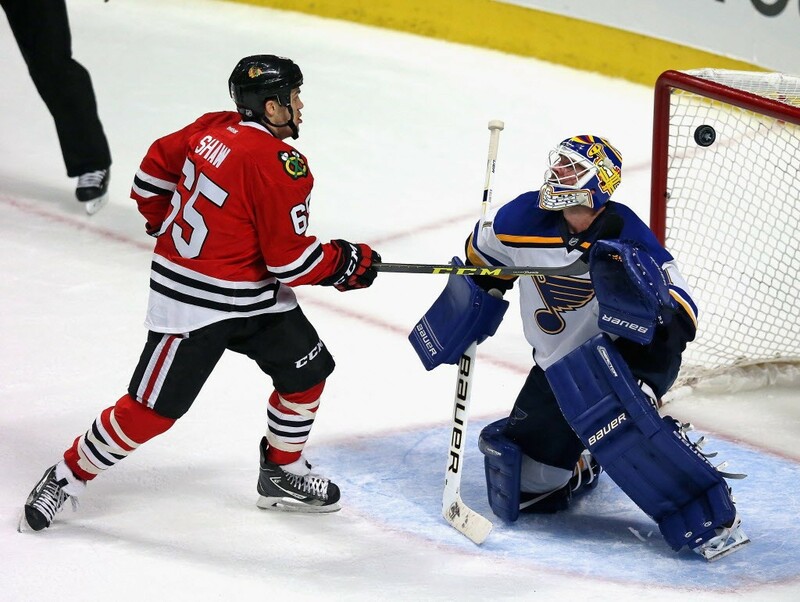 If you wonder what that word is, it's probably necessary to watch a video and read Shaw's lips, as the Blackhawks forward screams something from the penalty box during the final seconds of Tuesday night's 4-3 loss to Saint Louis. You won't hear the word, as there was no mike on Shaw during his meltdown. And it's the kind of word newspapers discuss without ever saying what they're talking about. "When [Blackhawks forward Andrew] Shaw went to the penalty box to serve his sentence for ill-timed idiocy, he was caught on camera mouthing a homophobic slur at an official," wrote the Tribune's Steve Rosenbloom. "Some might call it a 'possible' homophobic slur. Those who would debate it likely don't have eyes." The Tribune's hockey writer, Chris Hine, wrote to explain why "I was so disappointed when I saw video surface of Shaw using a homophobic slur." Hine is gay himself, and he recognized what Shaw was saying even though he didn't hear it. Meanwhile, in Saint Louis, Cardinals fans were accused of making racist taunts too vile for the media to repeat—though journalists felt they had license to say the taunts involved "the N-word." Once again the taunts went unheard. In this case, however, the reason seemed to be that they were never actually uttered. The matter was examined in a column Wednesday by the Sun-Times's Steve Greenberg. Greenberg had decided to cut the Cardinals' fan base down to size as "sanctimonious and self-involved." Grist for his thesis was a story from the New York Daily News accusing Cardinals fans "of having 'blitzed' Cubs outfielder Jason Heyward with the N-word" during Monday night's game. Heywood is the notorious apostate who'd turned down more money from the Cardinals to sign with the Cubs. The problem, as Greenberg acknowledged, was that the story claimed the "vile shouts" could even be heard over television—which wasn't true. "In fact," Greenberg conceded, "there was next to no corroboration—not even from random voices on Twitter—of the Daily News' story." Players from both teams said they heard nothing. And that includes Heyward himself. This presented Greenberg with a problem. To bolster his case that Saint Louis fans aren't nearly as splendid as they think they are, he found himself citing undocumentable misbehavior. It would take nimble logic to pull this one off. "I don't feel like it's a story," said Heyward. But Greenberg retorted, "We should be careful not to paint it as a total non-story. Heyward may not have heard the N-word on Monday, yet if he had, it wouldn't have been the first time he'd heard the term hurled by cowardly bigots in the stands at a big-league ballpark." I think what Greenberg is saying here is that even if Heyward didn't hear the N-word, you know how fans are! Some probably thought it! No one may have heard the F-word on Tuesday, but everyone's certain Shaw not only thought it but screamed it. Most of the time, when fuming hockey players scream in penalty boxes no one hears them but themselves, But if we didn't hear Shaw either, a camera saw him shake his stick and move his lips. That's all it took. The Blackhawks play to win, even as they're lined up for a relatively favorable playoff opponent in the first round of the NHL's Stanley Cup playoffs.